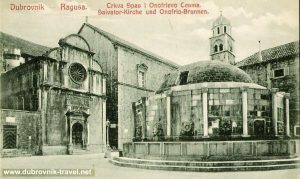 Onofrio’s Fountain with Saint Saviour’s Church and town walls of Dubrovnik in the background. 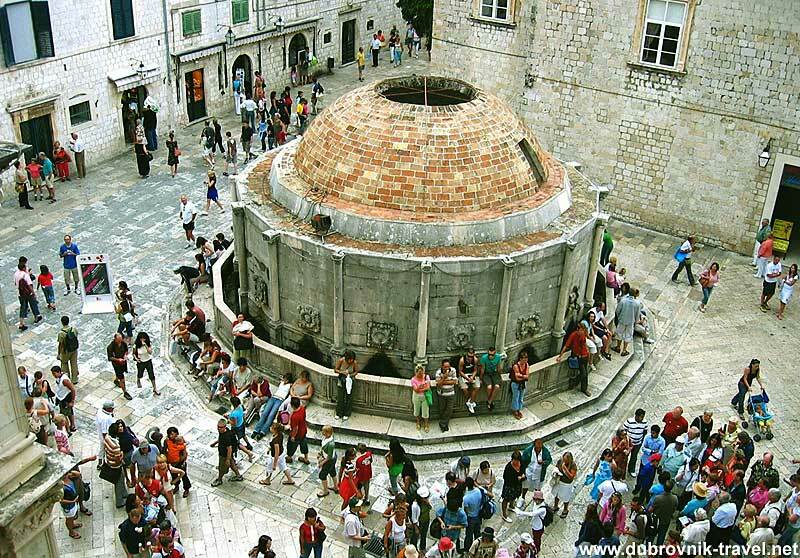 As soon as you enter into the Old Town to Stradun through the Pile Gate on your right side you will see the large rounded polygonal shape structure with a cupola and 16 water taps. 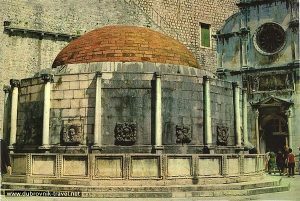 This is the well known Large Onofrio’s Fountain, designed in 1438 by the prominent Italian architect Onofrio di Giordano della Cava. 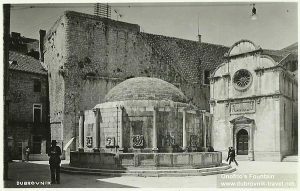 He was an Italian architect from Napoli who got a job in the town to design the Towns waterworks and fountains. 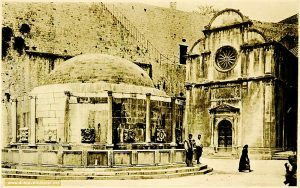 In the period from 1435 to 1442, he also designed and constructed a 12 km long water supply system that brought water from the Knežica spring, Šumet River in Rijeka Dubrovacka to the Old Town. The waterworks were in use by the end of the 19th century. 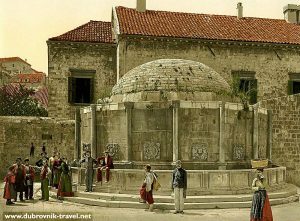 The fountain is embellished by 16 stone carved masks (maskerons) and a statue of a dog that adorns the top walls of the fountain. Locally called “kuchak” aka fountain dog, the replica of the dog statue was reinstalled in 2016 as it was badly damaged. 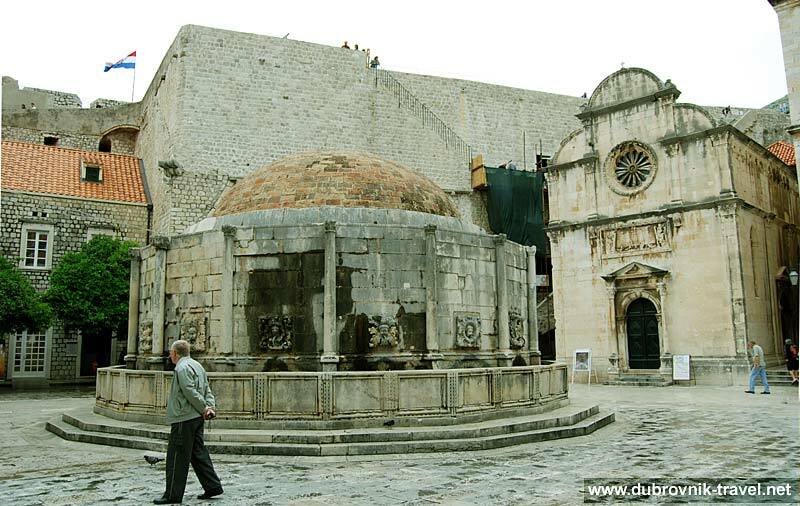 The whole fountain was badly damaged by the earthquake in 1667 and rebuild since. 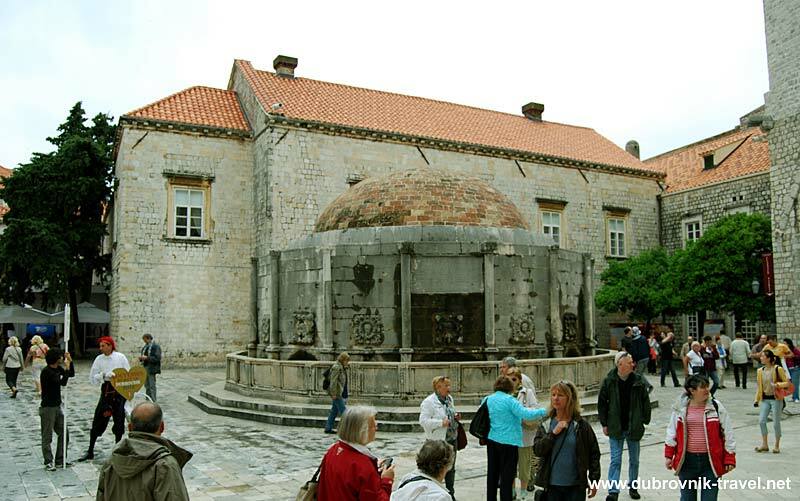 Located on the other end of Stradun, in the corner of the Luza Square, next to the entrance from Ploce Gate this fountain is also designed by the same architect and made by the sculptor Pietro di Martino from Milan. 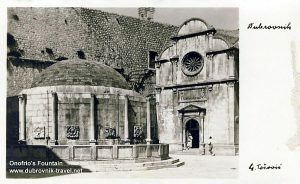 It is structured as octagonal pool, embellished by reliefs of boys, pillars, dolphins and shells. 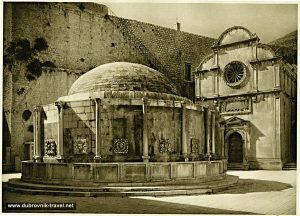 The fountain is featured in Novela od Stanca play (see video) by local Renaissance playwright Marin Držić.